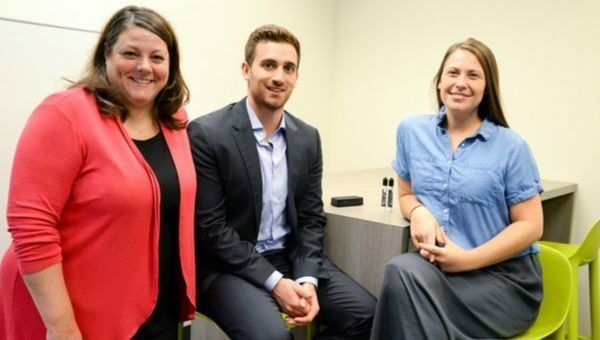 From left: Nicky Monk, director of VCU Ventures, and New Venture Managers Dominic Costanzo and Lacy Spott. Photo by Pat Kane, VCU Public Affairs. The program, called VCU Ventures, helps launch and support startup business ventures that are based on intellectual property born at the university. The program was announced this month and is housed in the VA Bio+Tech Center downtown. Monk said that most of the current projects are for medical purposes, though any faculty member or student with an idea worth pursuing can work with the center. These have ranged from a cancer therapy product to a new service firm. Monk noted that students could play a role in helping faculty members develop new technology. One of the projects involves using virtual reality technology to make 3D images out of 2D ones. Developed by Dayanjan Wijesinghe, Ph.D., an assistant professor in the School of Pharmacy, it may use MRI images to make virtual 3D human body parts. Surgeons would put on virtual reality glasses to conduct their surgeries in the virtual world before performing them in reality. Startups within VCU Ventures will operate under the school’s Founders First License Terms, a set of rules that lays out the ownership structure between the business and the university, as well as ownership of the intellectual property. The terms are meant to be executed quickly and are non-negotiable. That framework involves ventures based on intellectual property that VCU owns, which the school then allows to be released for potential startup activity. Qualified business ventures also must have high growth potential and plans to pursue venture capital investment, and their business model or plan must be approved by VCU. VCU will receive 5 percent ownership interest in the company, while allowing for sublicenses and forgoes all royalties, sublicensing fees and milestone payments. Monk said these terms are among the fairest in the country. VCU Ventures also plans on working with local business incubators and accelerators such as Lighthouse Labs in order to help future startups become more established. Monk did not disclose the center’s operating budget. Among the program’s first initiatives is the Venture Lab, which Monk described as a pre-accelerator program in which teams are assembled to work with a promising faculty technology. She said they’re selecting teams for Venture Lab for its launch in September.